BSTC Application Form 2019:- Apply Online Rajasthan BSTC 2019 Check BSTC 2019 Exam Date, BSTC Online Form 2019 Last Date, Rajasthan BSTC Online Form Apply Online. Rajasthan BSTC Rajasthan Basic School Teaching course (BSTC) is a State Level Entrance Examination conducted by bstcggtu2019.com i.e. Govind Guru Tribal University (GGTU), Banswara Every Year. BSTC Kota department released BSTC 2019 Official Website for students who wish to participate for D.El.Ed. BSTC 2019 Online Form / Application Form Apply Online Basic School Teaching course. The examination form is going to release on the date 18 March 2019. Candidates who wish to pursue this course can check the eligibility criteria and online application process here. The application form last date would be 10, April 2019. Read the full article to check the process for the BSTC Application form 2019. Rajasthan BSTC examination cell finally released the BSTC Online Form 2019 from 18 March 2019. The BSTC examination is going to be held in May 2019. The online form will be submitted through the official website. The last date for application form fill up process is 08, April 2019. Only Rajasthan BSTC Application Form 2019 will be accepted. Each and every candidate who covers the eligibility criteria can register for this exam before the last date of the application form process. ✮ Age limit:- The Age Limit Should not Exceed 28 Years. ✮ Nationality:- Candidate must be an Indian nationality and he/she should have Rajasthan Domicile Certificate. ✮ Educational Qualification:- Candidate must have at least 12th Certification from Recognized Board. ✮ Minimum Marks:- General candidates must have minimum 55% marks in their 12th. other categories must have 50% marks at least. ✮ If a Candidate is Pursuing Final Year can also Apply for this Exam. Rajasthan Pre BSTC 2019 से संबंधित किसी भी प्रकार की समस्या हो तो आप नीचे दिए गए कमेंट बॉक्स के माध्यम से पूछ सकते हो हमारी टीम आपकी पूरी सहायता करेगी! ✮ The exam will be Objective Type. ✮ The exam pattern will include 4 parts in itself. ✮ Total 200 Questions will be asked in the Examination. ✮ Each Correct Answer will be Rewarded 3 Marks. ✮ The total paper will be 600 Marks. ✮ No Marks will be Deducted for Wrong Answers. 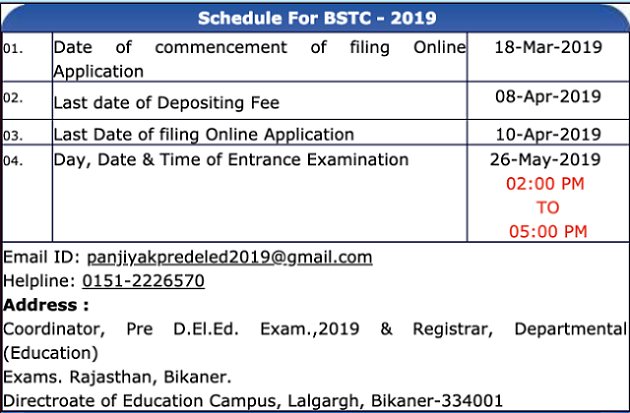 The Rajasthan BSTC Application Form 2019 will be submitted within the period of the given time. Candidates who submit their application forms after the time period will be rejected. Filling candidates will need to keep all the Scanned Documents and other details with them at the time of the application form. 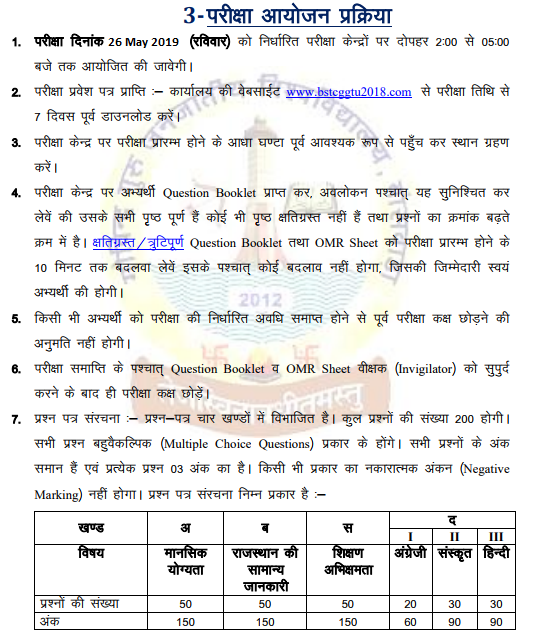 See the procedure for applying for this examination. Select BSTC Application Form 2019 Link at the Homepage. Fill all details like Your Name, Father’s Name, Date of Birth, etc. Attach the Required Scanned Documents there. Complete the BSTC 2019 Fees via Credit /Debit Card or netBanking. Take the Printout of the BSTC Online Form 2019 PDF. sc 48 % hai kya bsts ka form bhara jaa sakta hai.